Deep cleaning carpets is an essential chore for homeowners desiring to rid their floors of all dirt, dust and even pet dander. 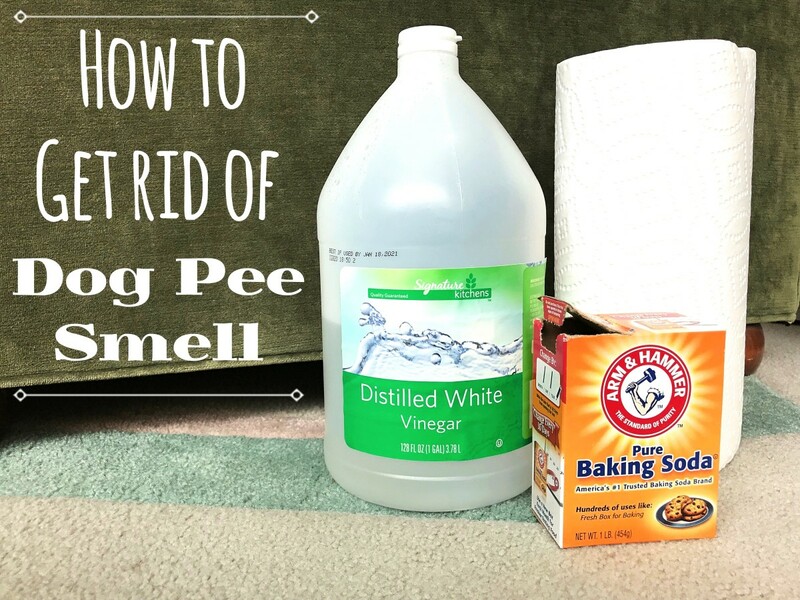 I have been on such a mission, and in particular am trying to remove all pet dander embedded deep down in our carpets since my husband has pet allergies. In addition to air purifiers, HEPA filter vacuums, and the like, I have now added the Bissell PROheat deep cleaner into my arsenal of weapons for this war on pet dander, dust and dirt. While researching the best way to clean carpets and rid them of allergens, I discovered that pet dander is "sticky" and actually clings to dust and dust mites. 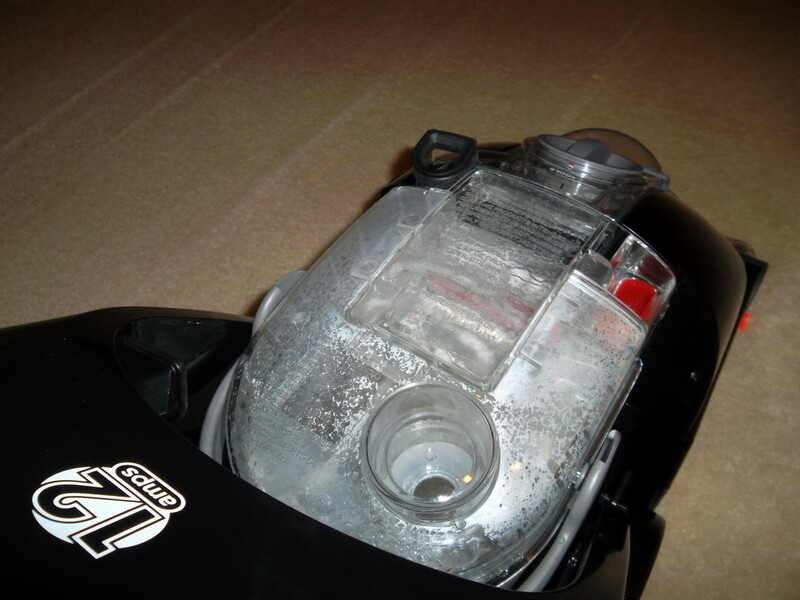 By removing the dust with a deep cleaner that vacuuming misses, pet dander should also be eliminated. 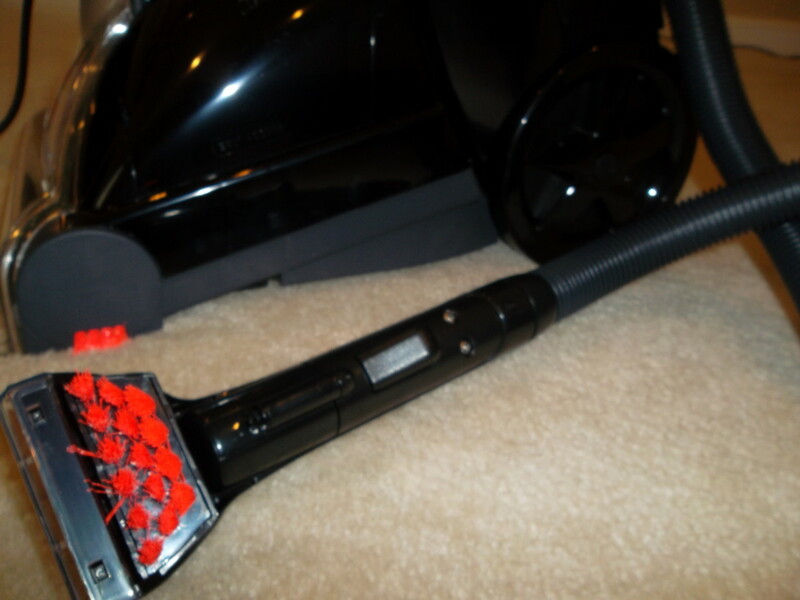 Billed as being powerful and the only heated deep cleaner, I selected the Bissell PROheat 2x from Target. 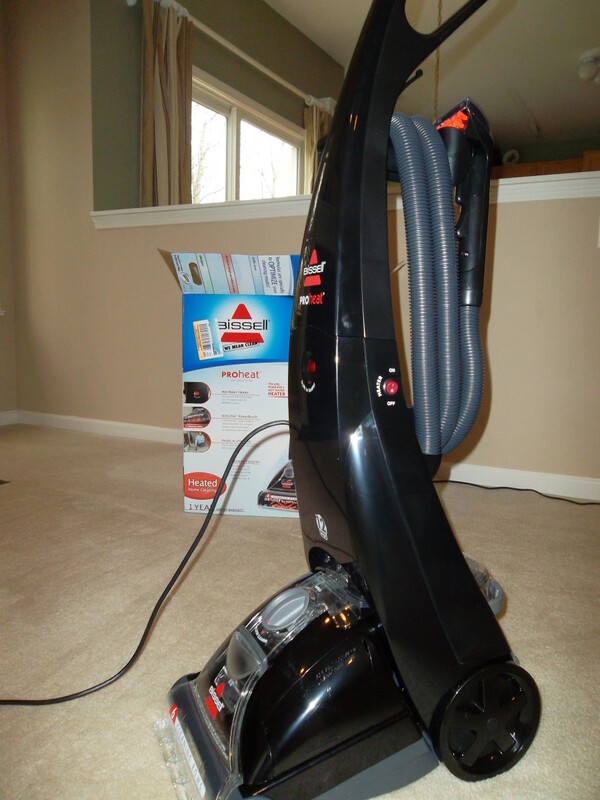 Additionally, Bissell has a variety of carpet cleaning solutions to add to the machine; I selected the allergen formula. 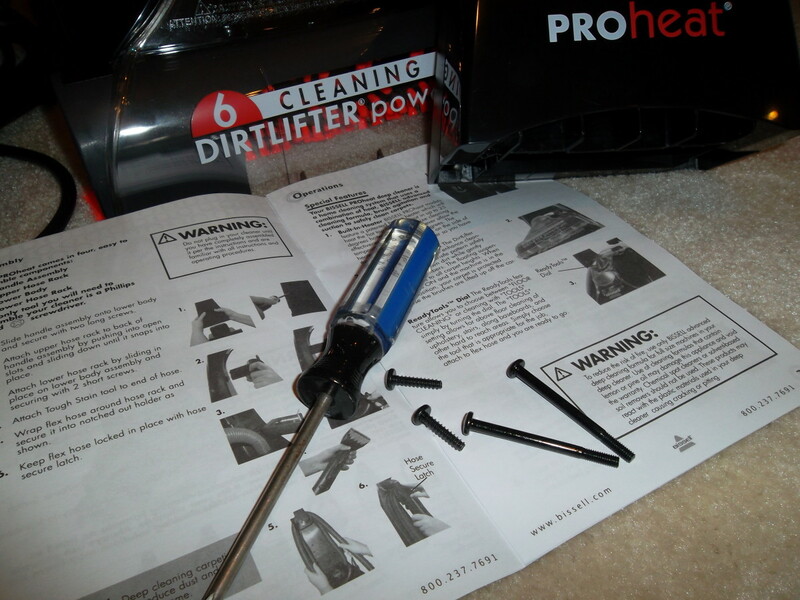 It only took 10 minutes to fully assemble my new deep cleaner! From the moment I removed the rather-large Bissell box off the store shelf and put it into my shopping cart, I was pleased. The carton itself has two pre-cut handles, one on the top and one on the side, making lifting and carrying a snap. Anxious to take my new deep cleaner on its maiden voyage, I figured assembly would slow me down. I could not have been more wrong. It seems the product engineers are as "thoughtful" as the packaging engineers. 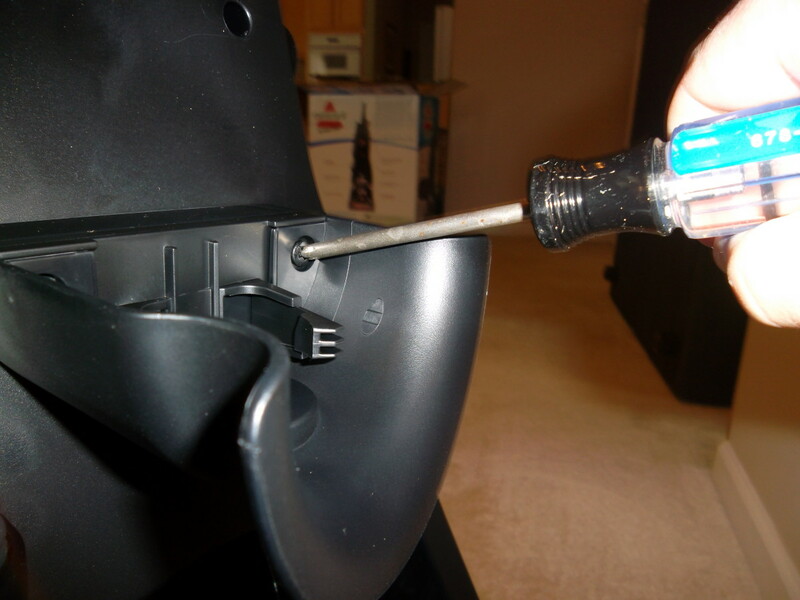 Assembling the deep cleaner is as simple as snapping and screwing the upper handle into the lower body; sliding one hose bracket into slots on the machine; and screwing the second hose bracket with two screws. Only one tool, a Phillips head screwdriver, is needed. 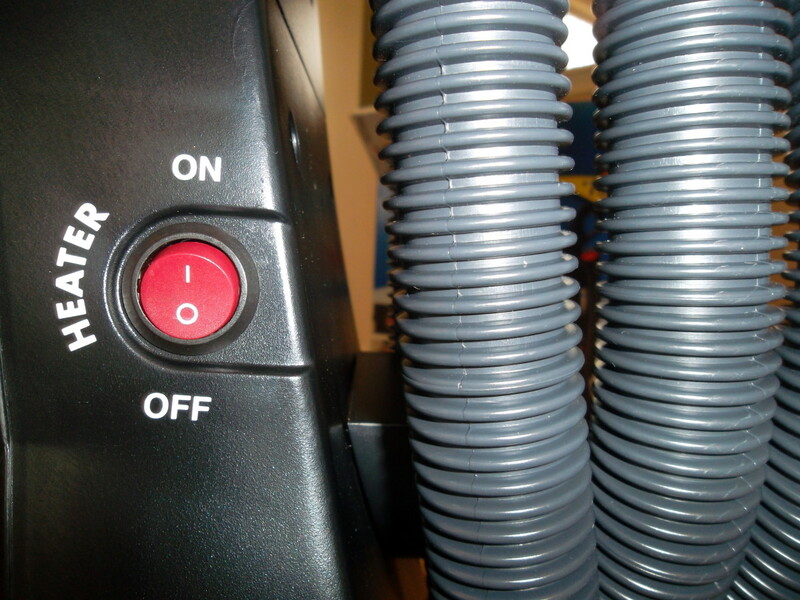 Once the brackets are attached the hose is easily wound around them for convenient storage. Figuring out how to use this deep cleaner is a breeze. How often do you have your carpets cleaned (either by you or a professional service)? The 2-in-1 water tank makes it incredibly simple to combine the correct amount of Bissell cleaner formula and hot tap water. The lid to the water tank contains a built in measuring cup with a "fill to here" line for the formula. (See pictures below.) 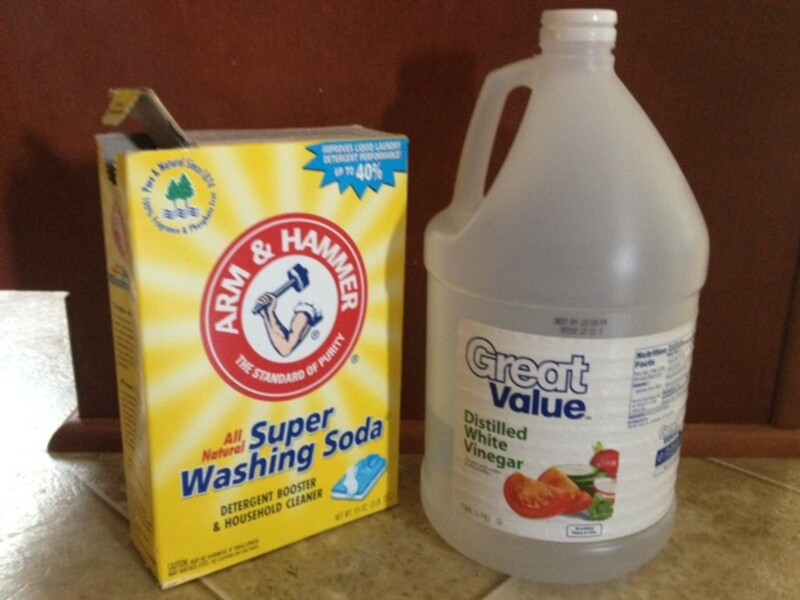 Making the cleaning mixture is as simple as adding the formula up to the "fill to here" line, pouring it into the tank, and then adding hot tap water until the tank is full. 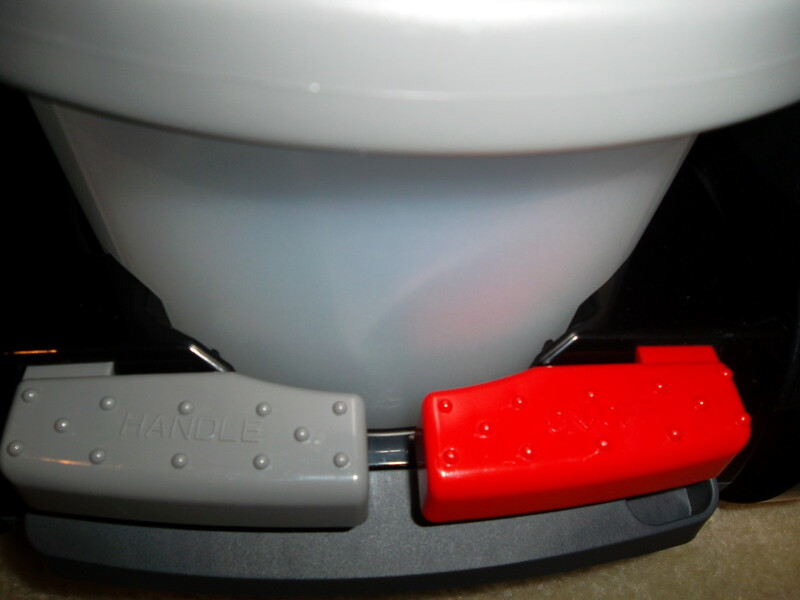 For ease of use, the tank has a handle so it can easily be carried from the sink to the machine. 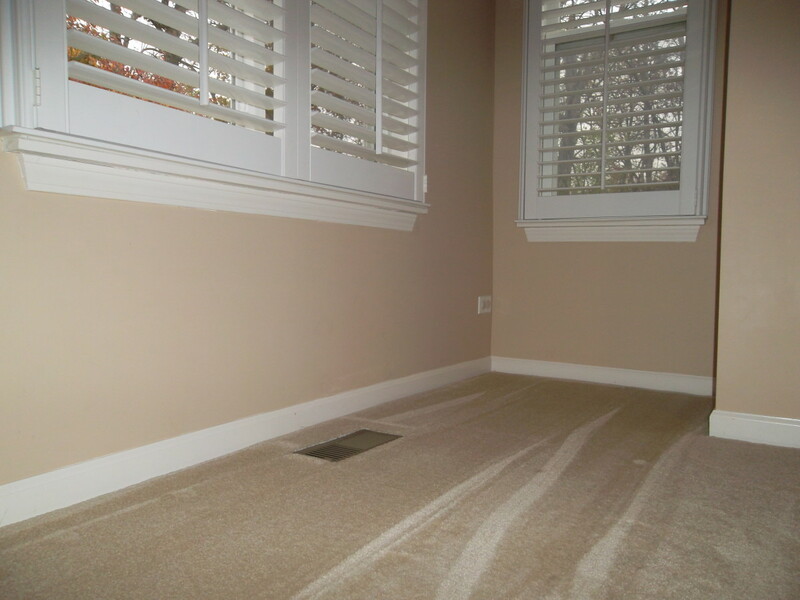 For best results, don't rush carpet cleaning. 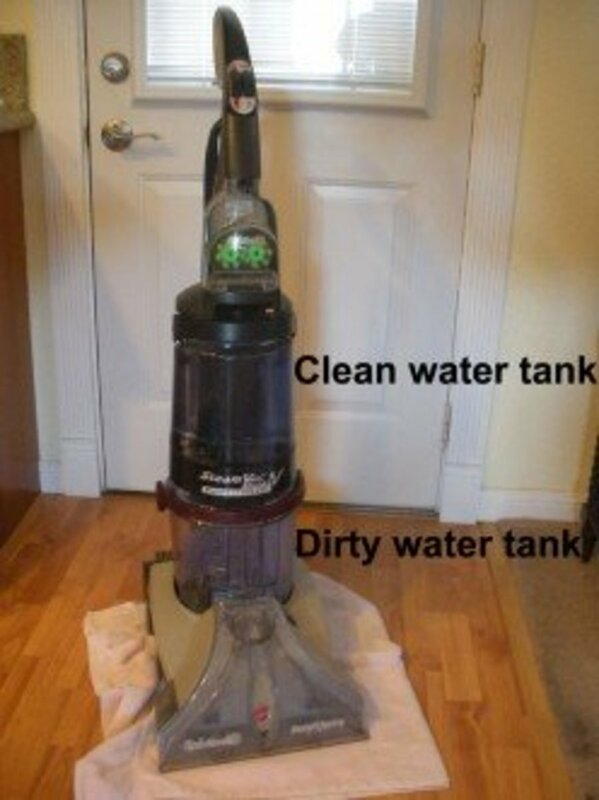 If you expect to clean carpets in the same amount of time it takes to vacuum them, you will be disappointed. But, by working in small sections at a time, and patiently moving the cleaner back and forth over the same path, the action and suction of the cleaner have the opportunity to perform their cleaning magic and remove most of the water. I doubt Benjamin Franklin was thinking about cleaning carpets when he said, "By failing to prepare, you are preparing to fail," but the concept is applicable. 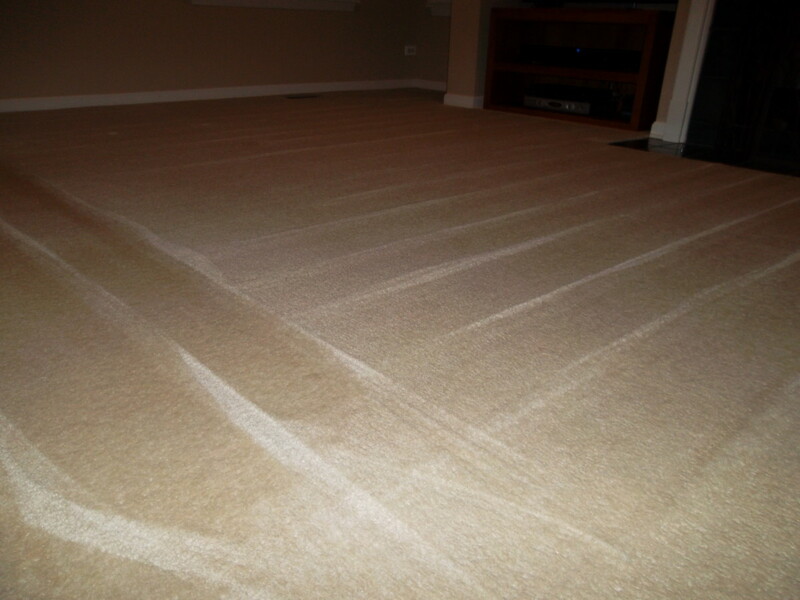 For the very best results, it is a good idea to prep the carpet for deep cleaning before even plugging it in. Preparing the carpet: In order to clean the entire carpet, remove as much furniture from the room as possible. With the room cleared out, vacuum thoroughly, making sure to get close to the baseboards, as well. 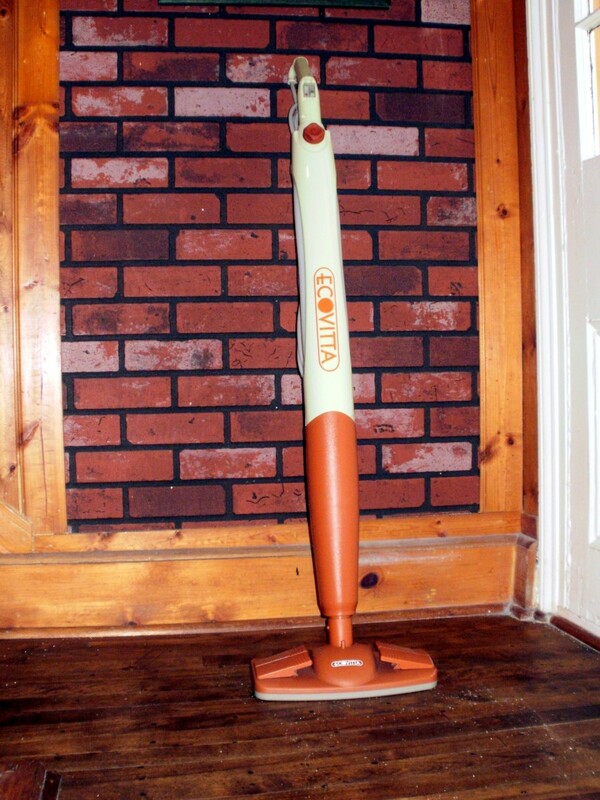 Consider vacuuming a couple times in different directions to remove as much dust and debris as possible. Cleaning the carpet: Since the carpet will get damp and needs a little bit of time to dry, it's best to start the deep cleaning in a back corner and work your way out of the room. After filling the water/cleaning tank and putting it on the machine, plug the machine in, making sure the dial is set to "floor." One thing that makes the Bissell PROheat exceptional at cleaning carpet is that the water can be heated up to 185 degrees. Turn the heat switch to "on" and wait about one minute. The heater will heat the tap water added to the tank an additional 25 degrees but will not exceed 185 degrees total. Release the handle (gray foot pedal) and use the spray trigger on the handle to wet the carpet on the first forward and backward pass over the same area of carpet. As you move the deep cleaner over the carpet you will see the water being sucked back into the machine. Continue to move forward and backward slowly over the same area until not much water is being sucked up anymore. 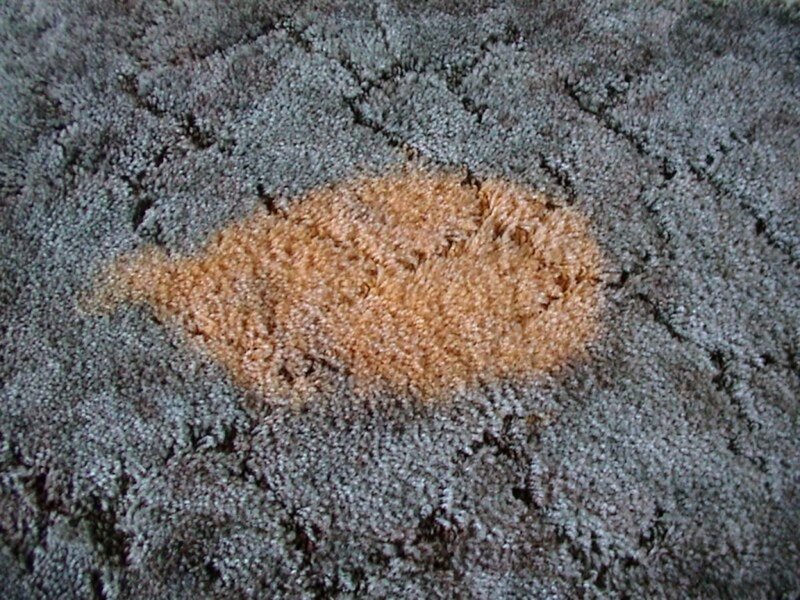 By not saturating the carpets, and removing most of the water, the carpets will dry within a few hours. Repeat this process until the entire carpet is clean. For smaller or hard to reach areas, switch the dial to "tools" and use the spray trigger on the hose which is equipped with the attachment. Throughout the cleaning process dispose of the dirty water and add more hot tap water and cleaning formula as necessary. 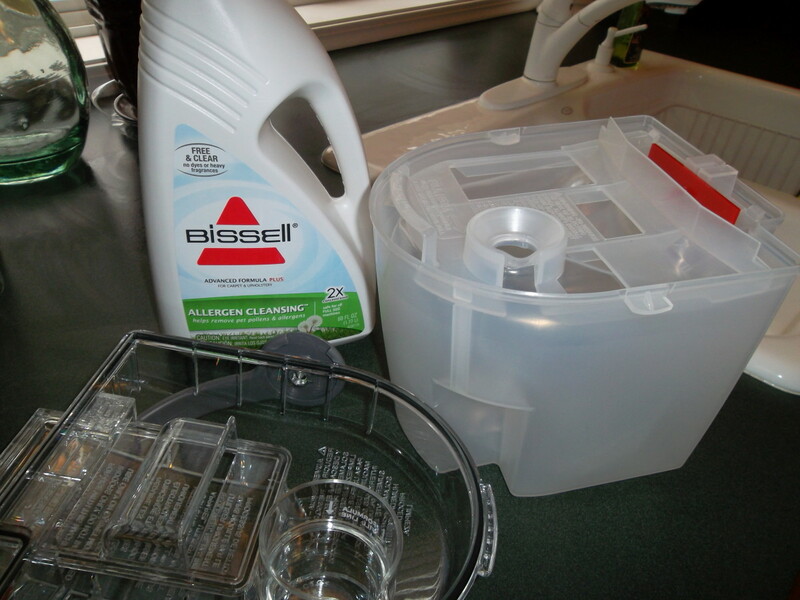 When I purchased my Bissell deep cleaner I gave absolutely zero thought to the type of water tank that is included. After operating this machine, however, I came to realize what an important feature the tank is to achieving the best cleaning job. 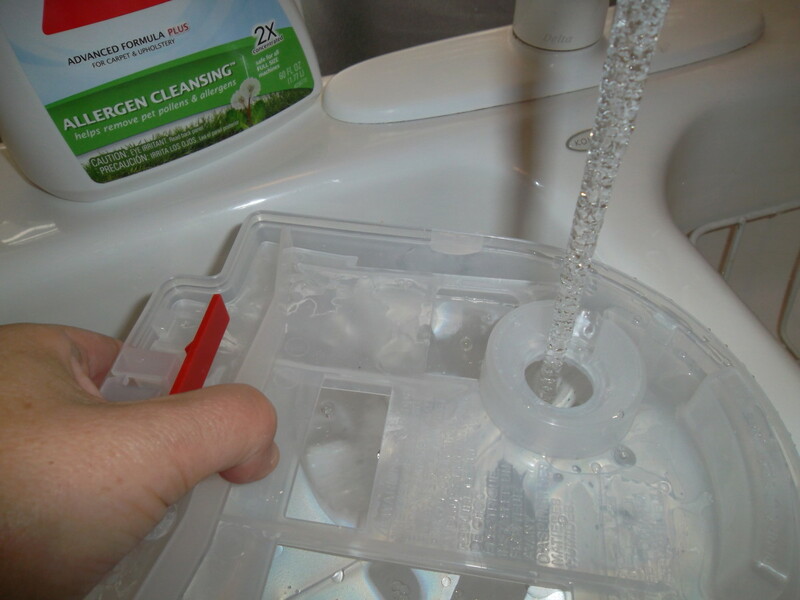 The 2-in-1 tank makes the Bissell an ingenious machine since the single tank contains two chambers keeping the cleaning solution and dirty water separated. Bladder (chamber 1): The bladder is a heavy-duty plastic bag within the bucket, and it expands when the cleaning formula and hot water are added to it. 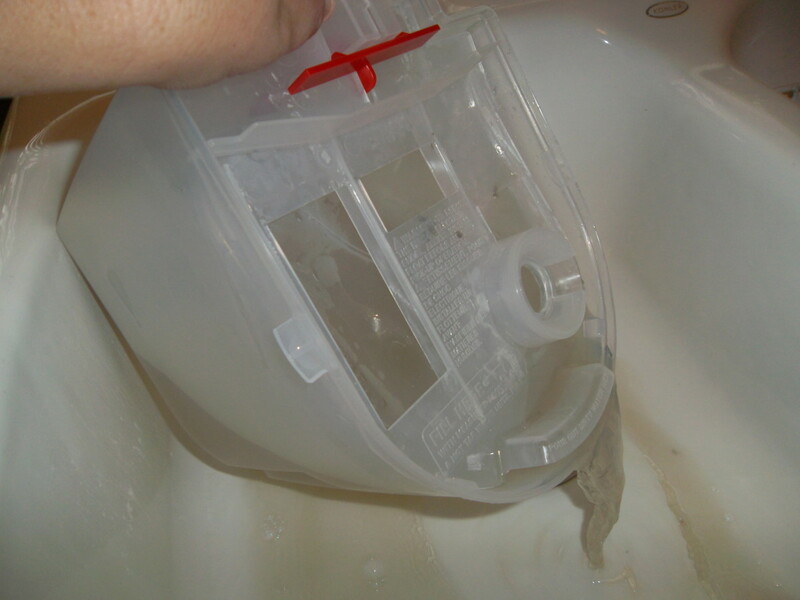 Bucket (chamber 2): At first the bucket is empty, but as the spray trigger is squeezed as paths are made along the carpet, cleaning solution empties out of the bladder and dirty water is sucked into the bucket. Additionally, the size of the 2-in-1 tank is perfect for most typical rooms in a home - not too big, not too small. As you clean, expect to make several trips to a sink to empty and refill the tank per room (depending on the size of the room). Just remember, if the tank was larger it would be difficult to carry when full, as well as awkward to pour out the dirty water. 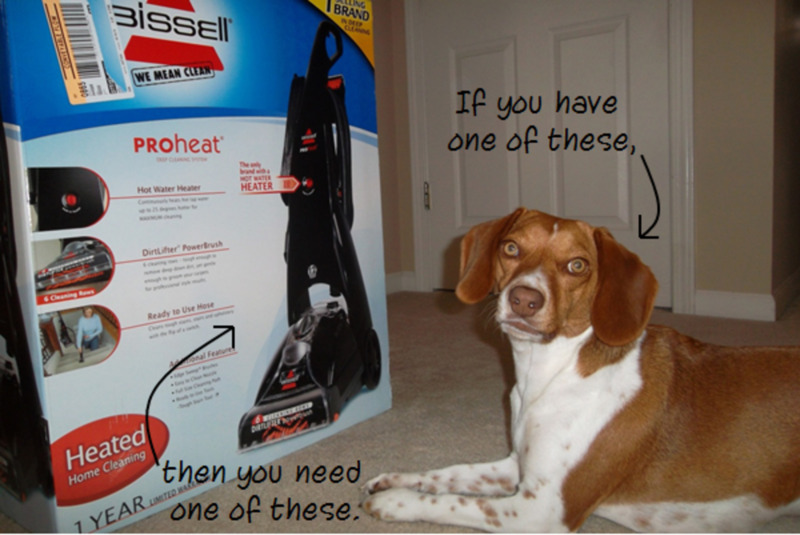 The Bissell PROheat deep cleaner is a must-have appliance for any homeowner, especially homes with pets and children. A lot of value is packed into this $149 deep cleaner. With 12 amps of power, a rotating brush of bristles, and heated cleaning solution, this machine does an excellent job of removing deep down dirt (and hopefully pet dander) that a vacuum does not have any hope of getting. 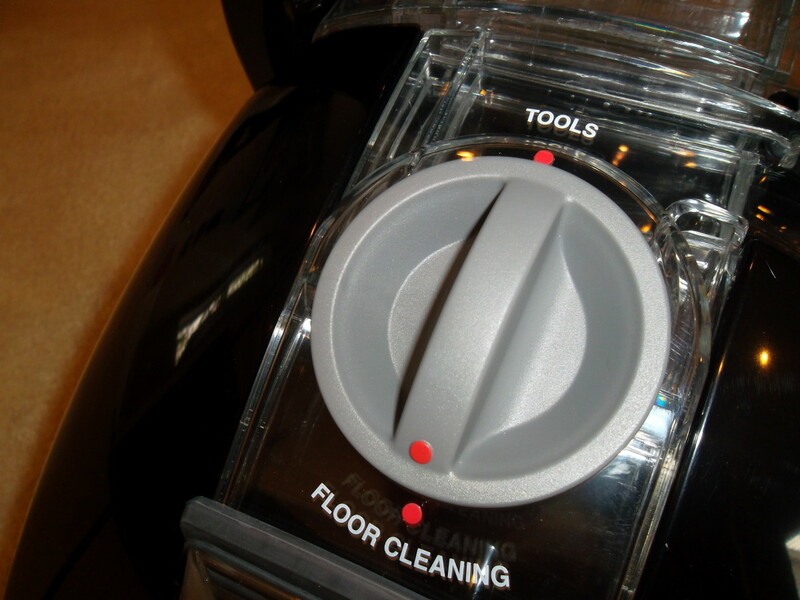 The Bissell Allergen cleaning formula did an effective job at cleaning stains, making the carpets like new. From well-placed handles on the carton, to ease of assembly and use, the Bissell PROheat is a hit from start to finish. The addition of a stair cleaning attachment and a sample of pre-treating stain solution are the only improvements necessary. It's easy to see why Bissell is the #1 brand in deep cleaners. 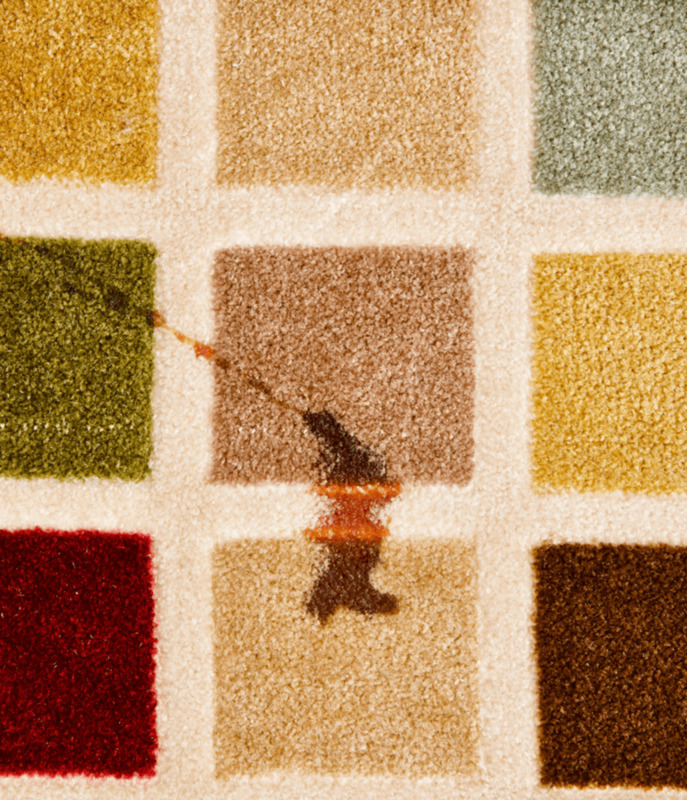 For a small investment, some time and old-fashioned elbow grease, any homeowner can keep their carpets deep-down clean. This is a very helpful article on how to thoroughly clean a carpet, especially if you have dogs. It's nice to know you can have BOTH a sparkling clean carpet and your beloved dogs, too. Thanks Vespa. Carpet cleaners are relatively inexpensive these days and so much more lightweight than they used to be, making it a great tool to have especially for pet owners and/or allergy sufferers. We have friends who own the Bissell and are very pleased with it. They also suffer from allergies and have a golden retriever, so it's been a boon for them. 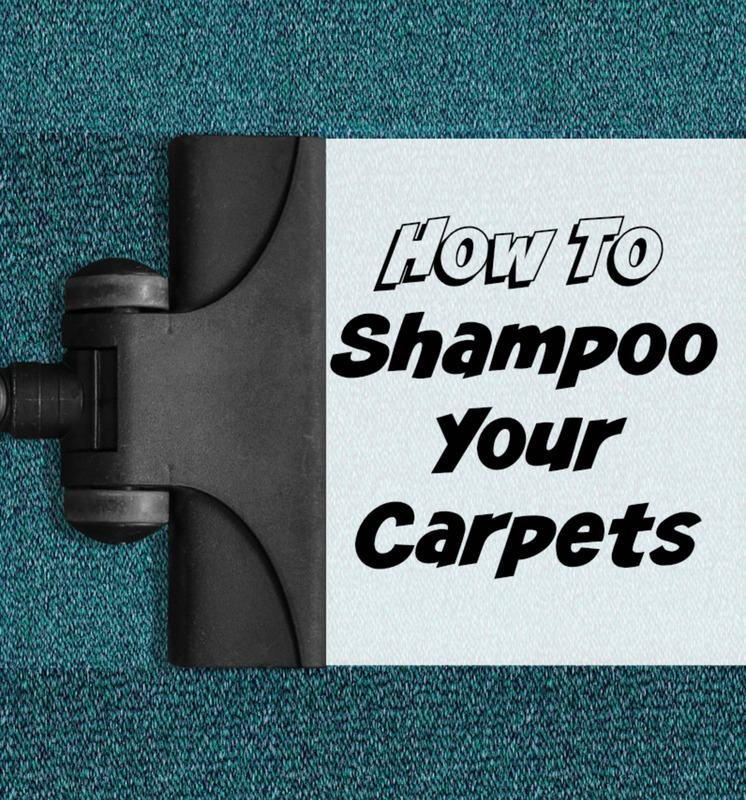 These are great tips for a thorough carpet cleaning. Thanks! I just realized that you don't have an amazon capsule in this. With such a great review you should add in the Amazon capsule to make some sales! Learning in Life - Thank you for both the compliment on this Hub and for referencing it in yours. I will have to check it out. Amazing product review hub. I actually referenced it in my Bissell SpotBot review! Thanks Dan. I'm glad the review helped you out. You may want to consider the handheld Bissell that is portable. It still would be nice to clean the area rugs from time-to-time (especially when your little one begins to crawl) and it's pretty compact so storage shouldn't be a problem. A Well-written review-great pictures to go along with it! I was going to buy the Bissell Proheat, as I have two felines, but then we decided to move. The new house has all hard wood floors. I don't think I can justify the storage space for the few area rugs that we have. Perhaps someday I'll pick one up and your review makes me more confident about that decision. Thanks so much RTalloni. Glad you found this review helpful. My dog does look a little innocent (haha), doesn't she? Funny thing is, even if I didn't want her next to the Bissell box, she would have been there anyway. That's funny Deborah. I have to say I'm glad I only have one fourth the pets you have. I really don't know how people like you with more than one animal do it actually - I guess your Bissell must have to work overtime. The photo captions made me laugh. You might as well have lined up my dog and three cats. Thank God for our Bissell! Thanks Millionaire Tips. It certainly would be handy to use on sturdy, large-size area rugs; good idea. Congratulations on your hub of the day. Great review and photos. 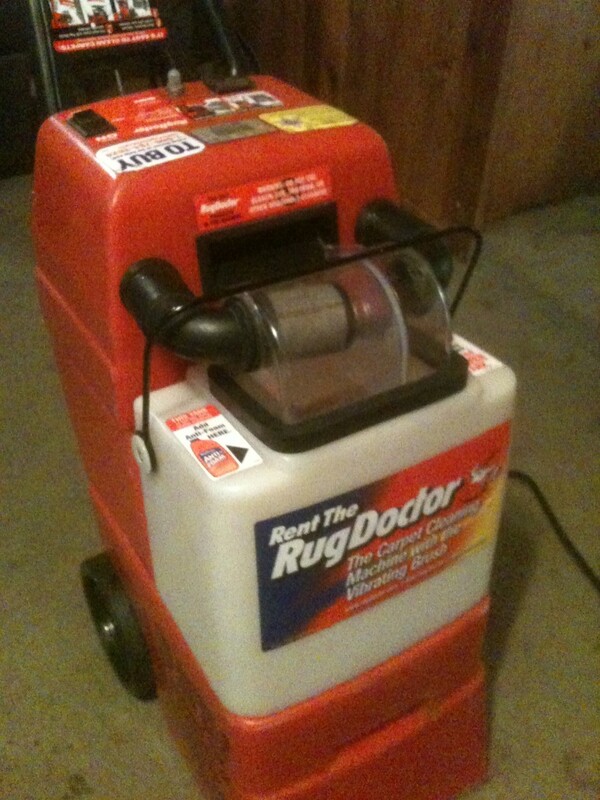 Even though I mostly have hardwood floors, you have convinced me that I need this carpet cleaner for my bigger rugs. Dog + allergies = carpet cleaner. Voted up. Happyboomernurse - Thank you so much for the really thoughtful comment. I'm glad you found the photos helpful; I'm a little partial to the first one myself. I certainly appreciate the votes, as well. I had to do a double-take, cause I came here to congratulate you on the contest win and the first thing I saw was the HOTD award! Congrats on both. I particularly love the first photo and the clever captions that you added to it. I also liked the fact that you included step by step photo directions that illustrated the ease of assembly and use. Voted up across the board except for funny and good luck on the next round of the contest. This is surely a worthy, very comprehensive review. Double thanks, Denise - Glad you found it interesting. Thanks for the input Jamie. It's good to know Bissell makes a good product no matter its purpose. ArnMan - Now that I have a carpet cleaner, I only wish I had it sooner for doing the types of cleanups you describe. movingout - Nice to know this review was timely for you and would love to hear back from you if you get a Bissell deep cleaner and your opinion of it. Thanks for the vote. 6 years ago from Alexandria, La. I have that exact same one and I actually used mine today to clean up spilt drink spots and other little mishaps. I am glad I have it and hope it lasts a long time. Great info! Being in the market for such a machine, I will have to check it out! Votedup! Arianna Dimou - You're welcome. Those four little paws certainly can track in dirt, even if it doesn't seem noticeable. Jamie - Glad to know this review was useful. I hadn't read any reviews before I bought my Bissell, but I did figure I didn't have too much to lose since at $149 it cost a lot less than having my carpets done professionally. Obviously, you can tell I'm glad I got it. I’m convinced, I never bought a carpet cleaner and now that I own a dog I’m ready for one. Thanks for the review. Sounds like a great carpet cleaner.. will definitely be keeping this brand in mind. You never know if you are going to get your money's worth so this is very useful. Thank you for sharing! rebeccamealey - Haha. I believe I see one of "these" in your photo. Definitely keep this carpet cleaner in mind when the time comes to buy a new one. I have two of "these" so I really need one of THOSE! Thanks for a great review. I will consider this machine when it's time for a new carpet cleaner. Congratulations! Thanks pstraubie48 - I wish I had all hard wood floors instead of carpet like you. Thanks for passing this review along to your friends. 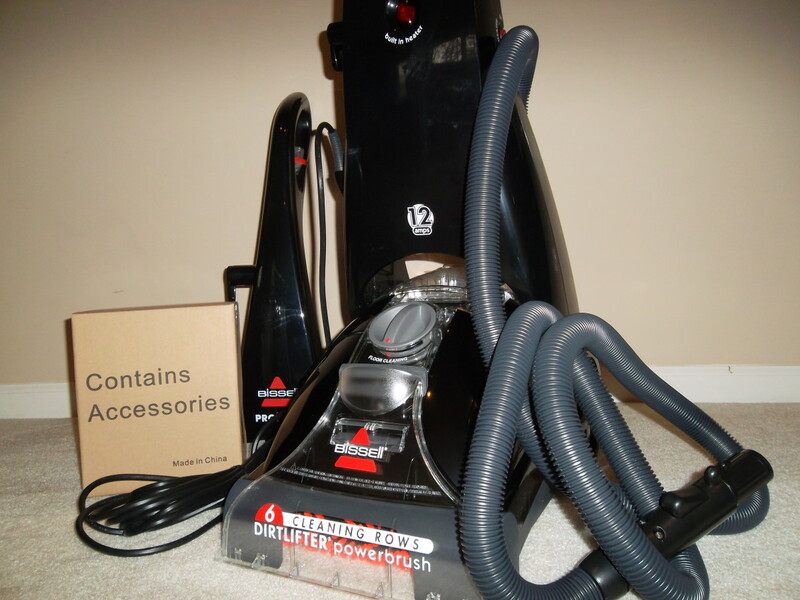 StephanieBCrosby - I was surprised how lightweight the Bissell I got is too. Actually, I don't even think it's any heavier than my upright vacuum cleaner. Thanks ComfortB. If you have carpets, I think it's worth it to own one of these. Stop back if you ever get one. I would love to hear how it worked for you. Great product. I really do need to deep clean some of my carpets. Something to look into. Great hub, and congrats on the HOTD award! I have a Bissell very similar to this one. It was a "Mother's Day" gift from my husband. Actually I think he just used our Amex points to get it. But it does a really good job of cleaning, and it is lightweight considering everything it does. Three cats and a dog, moonlake? Wow. It probably would definitely be worth it. Oh I need this. With three cats and a dog seems the house is always a mess. Great review. Voted up. Thanks K9keystokes - Glad you liked that photo; I'm partial to it too. It's interesting to hear of your experience with your Bissell, as well. I love this hub for the opening image alone!! I have one of the Bissel steam carpet cleaners. I agree almost exactly with you review pro and con points! Well done hub! chrissieklinger - Obviously, I think it's a great value. There's just no way for three dogs to not track dirt onto carpets. 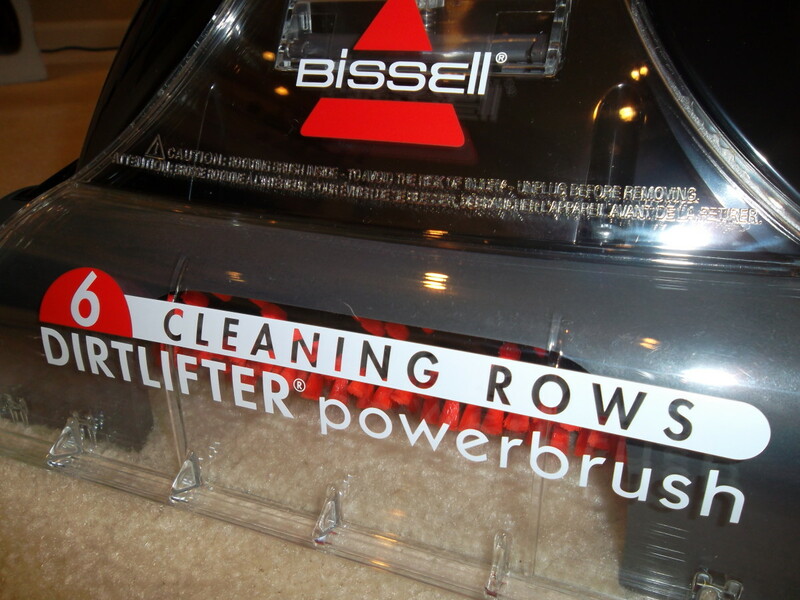 Bissell makes a variety of cleaning solutions to add to the water. If you have stains you may want to get a solution designed for heavy duty cleaning, but I think you can tell from the photo of the dirty water being poured into the sink that the allergen formula did a nice job cleaning my carpets. Thanks for your comment and votes. I have three dogs and have been considering a steam cleaner but wasn't sure if it was worth the money. It seems like this is a great value. Nice review and a lot of great info......voted up and useful! Thanks bridalletter. I'm glad you found this review to be both helpful and timely. Great timing, exactly what I needed. My first choice are always Bissells. I am in the market for a carpet cleaner since the old green machine is so big, bulky and just not as good as it could be anymore. Thank you for such detailed information and preparation tips. Truly helpful review! Steph - Years ago I bought a different brand carpet cleaner and was so dissatisfied with it that I returned it. I was definitely skeptical when I bought this new Bissell, but was thrilled when I realized it works so well. 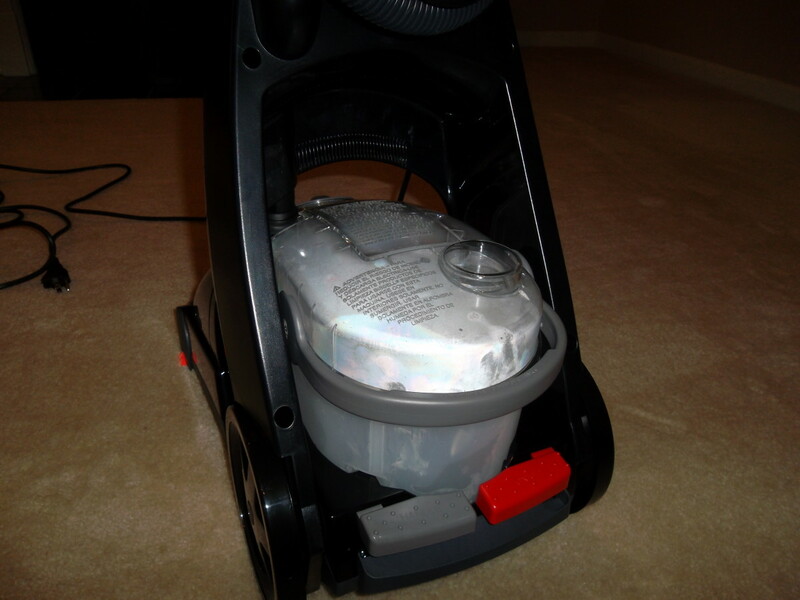 Thanks tillsontitan - Good to know that you also found that your Bissell works well and is easy to use. Very well done ktrapp. You've covered all the parts, how to use, and how it works, so well. I have a slightly different model but know it works that well and is that easy to use.